June's full printable menu is here! Money is tighter this month, so this meal plan is full of less expensive (but still delicious!) recipes that we enjoy. This is a full month of cheap Trim Healthy Mama meals with printable shopping lists. If you're a grocery budget rockstar, I'd love to hear about your frugal favorites in the comments! Can you believe I've been posting these meal plans with shopping lists for almost a year? If you need more meal ideas, you can check them out here. I've also got money-saving meal ideas at these links: How I fed my family of six for a week for under $100, $7 GF Dinners Part I, $7 GF Dinners Part II. If you're interested in eating a healthy, frugal diet but you don't know what the “S and E” letters next to the meal names are, don't worry! Anyone can benefit from this healthy menu. Those letters are for the Trim Healthy Mama diet (which I highly recommend! ), and if you're interested, you can learn more about it in the Trim Healthy Mama book or with one of my free resources. MOST IMPORTANT if you follow Trim Healthy Mama: The clickable recipe links in the menu may not be THM-friendly as written. PLEASE make sure that you download and read the weekly instructions that make each recipe THM-compliant. As always, this menu is gluten-free. Each week, I’ll put up a new post with the week’s menu instructions, recipe links, and printable shopping lists. You can sign up at the very top of this page to get updates so you don’t miss out! If there’s no clickable recipe link, that means it’s super simple and you can make it to your liking. If, for example, you don’t know how long to cook chicken thighs, you can just season them to your liking and cook them the way you normally do, or search for instructions online. But I try to include some instruction with each meal idea to make it simple. Lots of the breakfasts for this month are pretty easy, like scrambled eggs, and don’t include instructions. As always, please note that my menu planning system includes repeating breakfasts, lunches, and snacks throughout the month for simplicity. That means there are lists of breakfasts, lunches, and a handful of snacks included on this menu. My kids and I enjoy the routine of knowing that on Monday we will be eating a certain thing for breakfast and a certain thing for lunch – it definitely saves time in the kitchen! Remember that THM is SO ADAPTABLE! You may need to swap out E for S, or S for E, or switch things up during the week. Don’t be afraid to mix up your fuel types and keep your body guessing! This menu and the shopping lists that go with it feed my family of 7, but my oldest is 11. If you have bigger kids, or big eaters, you may want to add more protein, rice, and veggies to your shopping list. It doesn’t hurt the recipes to add an extra chicken breast or 1/2 lb of ground beef to make a meal stretch, and you can always add extra rice or veggies or salads as side dishes for the kids. When money’s tight, I’ll grab a bag of potatoes and give the kids a baked potato lunch when I’m eating a salad, or serve them as dinner sides that I avoid. If you already need these ingredients and want to help keep WorkingatHomeschool.com running, using my affiliate links here doesn’t cost you any extra and definitely helps me out! You can check out my Resources Page to see where I buy my favorites. Here is the full monthly menu in a calendar view, with clickable recipe links. 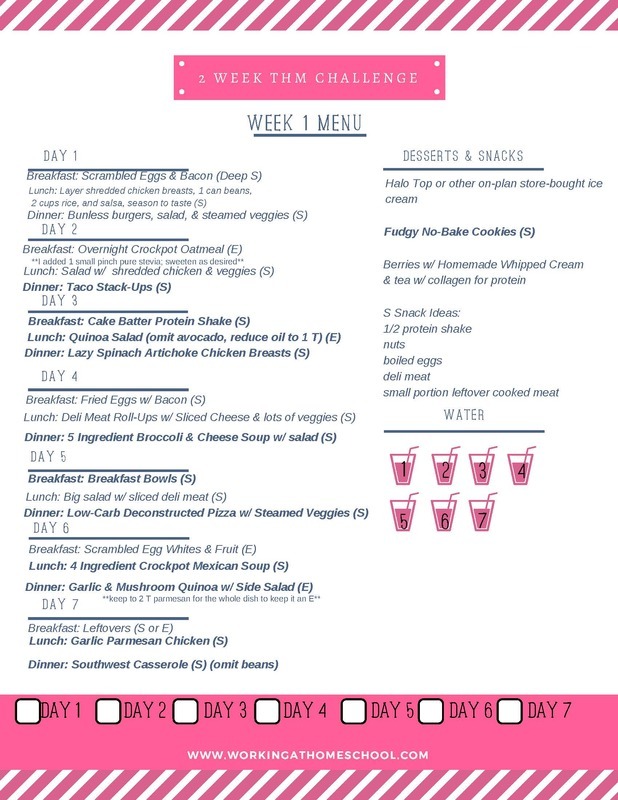 Please note that you will need the weekly menu instructions as I post them (like the ones below) in order to see the revisions that make these recipes THM-friendly. Thank you so much for sharing your menus, this is very helpful to those of us who find it a little overwhelming. I’m so glad the menus are helpful! I’m already making them for my family, so I’m happy to share! Lol, thanks Meghan! I’m glad it’s helpful! I appreciate the time you take into making this for us! It is very helpful. God bless you for being so willing & ready to help fellow THMers! I hope you love the food, Carol! Thanks, I hope you have a great week, too! Thank You so much! I really appreciate the time and effort you put into this…AND your willingness to share!! I am just starting THM and on a budget, so this is really helpful! I wonder how you do the portions though. For example, the zesty salsa chicken casserole’s recipe says it serves 4-6, so did you adjust it or should we assume that recipes are used as-is in the link? Thanks! Hi Candi! I just downloaded week 2 from a different computer and it is different from week 1. The breakfasts and lunches are the same, but the dinners and dinner links should all be different. Week 1 was shorter and had just a few days on it, but week 2 was a full week of meals. Congrats on being down 3.5 pounds!!! I love THM! Please let me know if you have a hard time downloading the instructions after you’ve tried again. HI. I have been using your menus for a while and you have helped me so much. Week 2 instructions are printing up as week 1. I have the shopping list though! Thanks again. Hi, I’m so sorry it didn’t seem to be working for you! I refreshed everything, hopefully it will work now. Thanks! Am I missing Week 2 somewhere? There are only instructions/shopping lists for weeks 1 and 2? Thank you so much!!!! I appreciate your help! Thank you so much for putting this together! I’ll be using it this month. I always like finding ways to stay on THM and stick to my budget. This looks great! Yay, I’m glad it looks good; hope it helps! Many recipes I click on are linked to websites that are no longer available. I wish the recipes were an additional page I could print along with the meal plan. Hi Brenda! I’m so sorry you’re disappointed. This menu is several years old and while it takes many, many hours to put these menus together, I haven’t had a chance to go back and re-check this one, but it’s been on my list! I have not been promoting this one because DarciesDish.com had changed her website name and I hadn’t had a chance to fix it yet. I spent the morning uploading a new version with working links, so feel free to download that one for now, and I’ll be making further changes before June of 2019. Thank you for understanding!